Your recruit is on his or her way to becoming a Marine and learning a vast amount of new knowledge. As parents and family members of a recruit, you've got a lot to learn about the Marine Corps lifestyle as well. But one of the most important things you'll learn, is respect for the privacy and safety of your soon-to-be- Marine. The internet is a vast array of informational websites, chat rooms, message boards, social networking, and online communities for folks with similar interests to share news and stories. 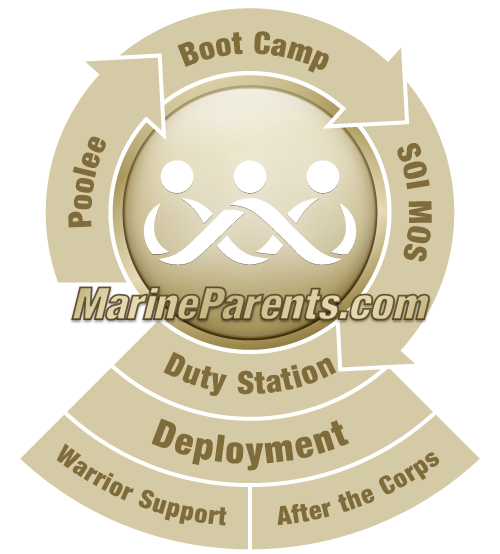 Certainly hooking up with other families with recruits going through boot camp at the same time gives a sense of belonging and adds to the experience. But be careful what you share. Personal information about Marines or recruits should not be shared in any online environment, including but not limited to identifying information such as last name, email address, phone number, birthdates and addresses. You should use discretion when providing any personal information. Identity theft is rampant, and something as simple as a graduation date with a comment about his or her birthday being in two days is enough information for potential thieves to be successful. Keep your recruit safe; share your feelings and emotions, but do not share your Recruit's personal information. There are two levels of Recruit Privacy that are important to realize. The first, is that your recruit has the right to maintain his or her privacy at all times, including asking you to limit what you share with others about his/her experience at boot camp. He or she may not want you to talk about his successes or failures during boot camp; keep your conversations with others generic. While public congratulations are certainly in order upon graduation from boot camp, resist the urge to publicly congratulate daily successes or express concern with your recruit's performance. It's simply a matter of respecting the privacy of others, including your recruit. This isn't soccer team Saturday; this is your recruit's adult job. Secondly, all branches of the military have a chain of command to follow for questions, complaints, inquiries and comments. Information your Marine or recruit may share with you regarding his/her command should be kept private out of respect for all Marines. Your Marine or recruit may ask you for assistance or you may feel it is necessary to offer assistance by contacting military personnel. Please verify with your Marine or recruit prior to taking any action or making any contacts on his/her behalf. This is your Marine's job. The Marine Corps is his/her employer. The Marine Corps is not obligated to discuss job performance or duties with anyone other than the Marine. As your recruit joins the fleet and is assigned to his or her permanent duty station, he or she will share things with you in confidence because your Marine trusts you not to share it with others. You'll want to encourage those discussions with your Marine and then keep those conversations to yourself. Sharing his or her job duties, expectations, dates, times, locations or other pertinent information is a recipe for failure on two fronts; breaching your Marine's trust, and putting the safety of other Marines in danger by sharing specifics of his or her job. Your recruit's privacy and safety are of the utmost concern to his or her drill instructor and should be the highest priority for you as well. This simple rule of "if in doubt, don't" will help you make determinations of whether or not to share. This site is my 'Marine Bible.' It has all guidance and information to help me support my son and keep me informed as well. —Christine B., recruit mom, March, 2016.